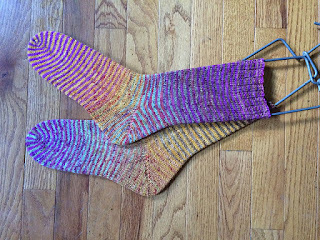 PogKnits: February Classes - Socks & Beginners & Sweaters, Oh My!! February Classes - Socks & Beginners & Sweaters, Oh My!! February is typically the coldest month of the year where I come from and a good time for making some cozy wool socks. This month at Southern Made, is Sock Skills Saturdays. This is a great way to pick up new skills needed for making socks. Drop in at 2:30 for 30 minutes with sock yarn and needles and learn! One beginner knitting session is being offered as well. Saturday, February 4. Beginners can choose from three projects. A baby hat, fingerless mittens and boot toppers And a 5 session sweater class, suitable for someone who can knit and purl is beginning the week of February 21st.